At least we have reached the point where the phenomenon is fully accepted. That it is difficult to model is no surprise and that any such modeling naturally begs confirmation is also no surprise. That they are uncommon is welcome but that they are dangerous also handily explains sudden losses of ships over the years. It would be good to develop a sensing and prediction system that can steer shipping away from the risk as much as possible. I think we can all agree on that and also that this would be the last remaining predictable risk faced by mariners that cannot be at least battened down for. Our technology is possibly up to the task, at least on paper. We need high resolution continuous satellite imaging of the sea lanes in particular. It is necessary to resolve wave height, wave length, wave velocity and direction over certain minimums and to do it fast enough to effectively track individual waves. We need to be able to do this in the middle of a storm. It needs to be capable of discerning a rogue wave, so that we can begin to back track possible patterns. As I said, we may now have the technology to do this by brute force methods. We avoid a loud side trip into interesting theoretical work which may never help much. We are actually creating a real time curvature mapping and watching for dangerous accumulations of wave energy. A ship would be sailing from one mapped patch into another. Importantly, the moment that a curvature event begins to coalesce, nearby shipping can be alerted as to direction in particular and likelihood of interaction. This provides time for the captain to take some action, if only to turn into the threat. It also opens the door for general avoidance of hazardless seas which accelerate stress wear on the ship itself. This is unlikely to do much to extend ship life but it surely will lead to better practice. Mastering this last variable in the operation of the seas is important. The best strategy for good seamanship has been avoidance of difficult seas. This has never been completely possible. This begins to make it much more possible and is a good first step toward more exotic shipping technologies. The displacement hull has been a work horse but had a built in speed limit that made sidestepping fast weather systems difficult. If sidestepping becomes a viable option, then nuclear powered fast hulls are plausible. Super cavitating hulls become worthy of effort. In fact all the toys played with over the past century can be dusted off and given a go. A half million ton container ship cruising at seventy knots per hour by use of a supercavitating hull and nuclear power would be very welcome on the shipping routes. We should also remember the potential of large ship air pad technology which I described for ice breakers. The same power plant and fan system would support a catamaran style vessel with fore and aft skirts to hold the air pad. This design gets better the bigger it is built. In fact, it is reasonable that such design built hugely could be used to quickly cross the Arctic even in the winter while avoiding obvious ridges. The large bergs are only coming off Greenland glaciers and are easily avoided also. A near-vertical wall of water in what had been an otherwise placid sea shocked all on board the ocean liner Teutonic—including the crew—on that Sunday in February, more than a century ago. 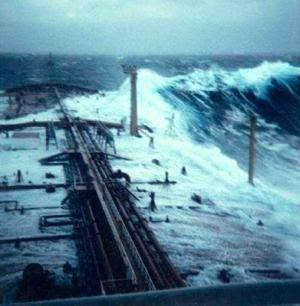 "Many of the passengers were inclined to believe that the wave was the result of volcanic phenomena, or a tidal wave. These opinions were the exception, however, for had the sea been of the tidal order Bartlett would have seen it coming." The volcano theory was just as unlikely: "Absurd, absurd," one of the Teutonic's officers told the Times. "It was a giant sea, and there is no doubt of that." This is just one of the many anecdotal accounts in maritime history of waves upward of 30 meters devouring ships, even swallowing low-flying helicopters. But what sea captains and scientists have long believed to be true only gained widespread acceptance after the first digitally recorded rogue wave struck an oil rig in 1995. "The seamen tales about large waves eating their ships are correct," says Tim Janssen, an oceanographer at San Francisco State University. "This was proof to everybody else, and a treat for scientists. They suspected it, but to see it and have an observation is something else." Now that there is no longer a question of rogue waves' existence, other mysteries have arisen: How frequently do they occur? Just how do they come about? Are there areas or conditions where they are more likely? Janssen is among a growing group of researchers in search of answers to these questions, which could someday lead to safer seas. Before any answers could be attempted, scientists first had to characterize a rogue (or freak) wave. The widely accepted definition, according to Janssen, is a wave roughly three times the average height of its neighbors. This is a somewhat arbitrary cutoff. Really, he notes, they are just "unexpectedly large waves." The wave that swept onlookers off the coast in Acadia National Park in Maine on August 23 may not fit the former definition, for example, because background waves were already quite large due to Hurricane Bill, and rogues typically occur in the open ocean. Yet that wave has still been readily referred to as a "rogue". No one is certain yet just how frequently freak waves form; accurate numbers are extremely difficult to collect given the waves' rare and transient nature. With more sophisticated monitoring and modeling—and as first-hand accounts are taken more seriously—the waves' prevalence appears to be rising. "[Rogue waves] are all short-lived, and because ships are not everywhere, the probability that a ship encounters one is relatively small," says Daniel Solli, who studies the optical version of rogue waves at the University of California, Los Angeles. "But with increasing amounts of oceanic traffic in the future, the likelihood of encountering them is getting larger." Some areas seem to breed the waves more than others. Janssen and his colleagues recently used computer models to determine that regions where wave energy is strongly focused could be up to 10 times more likely to generate a freak wave. He speculates that approximately three of every 10,000 waves on the oceans achieve rogue status, yet in certain spots—like coastal inlets and river mouths—these extreme waves can make up three out of every 1,000 waves. A paper describing these results was published last month in the Journal of Physical Oceanography. Various theories exist for how rogue waves form. The simplest suggests that small waves coalesce into much larger ones in an accumulative fashion—a faster one-meter wave catches up with a slower two-meter wave adding up to a three-meter wave, for example. Janssen and his colleagues build on this with a more complex, nonlinear model in their recent paper. Waves might actually "communicate—sometimes in a bad way—and produce more constructive interferences," Janssen explains. By communicating, he means exchanging energy. And because the conversations aren't necessarily balanced, he says, "Communication can get amplified enough that a high-intensity large wave develops." In other words, one burgeoning wave can actually soak up the energy of surrounding waves. Again, in those places where variations in water depths and currents focus wave energies, this line of communication can get especially busy. Janssen's models identified these rogue-prone zones. Certain conditions such as winds and wave dissipation, however, could not be included, limiting the simulation's predictive power. Meanwhile, Chin Wu, an environmental engineer at the University of Wisconsin–Madison sees another likely scenario spurring the monster waves: "If a wave propagates from east to west, and the current moves west to east, then a wave starts to build up," says Wu, who studies wave–current interactions in a 15-meter pool. The wave basically climbs the current's wall, rising out of what appears to be nowhere. Rogue waves have in fact been more common in regions such as the east coast of South Africa where surface waves meet currents running in the opposite direction. The only way to really know what is going on in the unpredictable oceans is to watch, Wu says. He acknowledges, however, that the investments in the instruments and time necessary for such fieldwork are immense. "We need to identify places where [rogue waves] are more likely to occur," he says, emphasizing the importance of numerical models—including the nontrivial accounting of wind and wave breaking—at this step, "and then focus on those areas." Janssen agrees with the need for more direct observations of ocean behavior. "We can make a theoretical prediction," he says. "But then we have to go out and see if nature agrees." If it does, the results "could provide a prediction scenario—made visible on maps—of hot spots that could change day to day," Janssen says. This could work much like tornado forecasting. SOME species of Australian birds are shrinking and the trend will likely continue because of global warming, a scientist said. Janet Gardner, an Australian National University biologist, led a team of scientists who measured museum specimens to plot the decline in size of eight species of Australian birds over the past century. The research, published last week in the British journal Proceedings of the Royal Society B: Biological Sciences, found the birds in Australia’s southeast had become between 2 per cent to 4 per cent smaller. Over the same century, Australia’s average daily temperature rose 1.3 degrees Fahrenheit (0.7 deg C), with the sharpest increase since the 1950s.